Animals are often brought to me because they exhibit confusing behavior. Using information gained telepathically from the animals themselves, we-humans, animals, and I-develop simple and effective solutions to the animals’ problems. 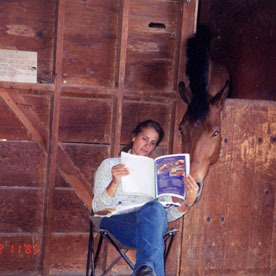 Since 1995 I have documented every session in my animal communication practice. These case studies provide great insight into animal consciousness as it travels through its phases of life, death and reincarnation. Many animals’ issues are caused by past life cellular residue. This residue is cellular information from a past incarnation that remains as the soul reenters the earth plane. The case studies of Lazarus, a five-year-old Dutch Thoroughbred/Holsteiner gelding and Pearl, a six-year-old female Dalmatian, clearly illustrate the effects of past life cellular residue. Lazarus was to be Ann’s dream horse. Bred through a sire and a mare with favorable credentials, he had success packed into his DNA. Yet by the time he was five years old, Ann was close to despair. Lazarus responded to some cues and ignored others. He had decent ground manners and he was affectionate. But he did not respect her in the saddle. A consultation revealed that Lazarus thought the behavior expected of him was completely confusing. He preferred to congenially walk with Ann, “his mare,” and felt it was inappropriate for her to sit on his back and order him around. He was, he communicated and I translated, “the boss of her.” However, a male trainer had been able to work with him. Most animals can respond clearly about their past lives and Lazarus was no exception. He said he had never been a horse before. He had been a “spectacular doe.” He had a horse’s natural self-assurance but lacked the past-life know-how to use it correctly with people. Lazarus was in a somewhat familiar prey-to-prey animal incarnation. That made his transition to his present life a little smoother than for the Dalmatian, Pearl, who incarnated from prey animal to predator. she became frantic. Her behavior clearly resembled the fear-and-flight survival mechanisms of prey animals. Sure enough, when we began to communicate, Pearl’s present behavior made sense. She, too, came from a past life as a doe during which she had been a dominant matriarch, seen in some deer, such as red-tailed deer. In addition to triggering her fear-and-flight behavior, Pearl’s past life cellular residue occasionally caused her to inappropriately dominate Dotte, her much wiser and experienced companion. This out-of-character dominance perplexed Pearl’s people. “I am clueless with other dogs, too,” Pearl said. “[I] need Dotte to explain everything to me, everything.” She also expressed distress at being captive in her foreign body. Her life was a mistake, she sadly communicated. She had thought of all the fun she would have as a dog but not of all the pain. With both Lazarus and Pearl, the problem and the solution lay in human expectations that were too demanding for either animal. Within weeks, Lazarus showed remarkable progress. Today, Ann is as much relieved as she is delighted by her ability to work with him. He is finally moving forward in his life adventure and learning what it means to be a horse. Pearl needed people to avert their eyes and keep their hands close to their bodies. No one was to approach her unless she made an overture. People were to be calm, soft spoken and slow moving until she became accustomed to them. Lisa implemented the plan immediately, and Pearl is slowly beginning to accept familiar people. She has even begun to play with a ball and is visibly enjoying the newly discovered perks of her life as a dog. It may not have been such a mistake after all.